It has been less than a year since Firebrand Theatre (whose artistic director, Harmony France, gleefully bills her company “as the world’s first Equity feminist musical theater”), pulled out all the stops with its inaugural production of “Lizzie,” a musical about the infamous Lizzie Borden. I missed the company’s second show, “9 to 5, The Musical.” But now, with its incendiary production of “Caroline, or Change,” the 2003 musical with a quasi-autobiographical book and lyrics by Tony Kushner (of “Angels in America” fame), and a scorching score by Jeanine Tesori (a Tony Award winner for “Fun Home”), Firebrand has easily secured its place among the handful of Chicago’s hottest “smaller” musical theater companies. Though to be sure, there is nothing at all “small” about the formidable assemblage of talent now onstage at its home, The Den Theatre, where this production – despite the enduringly troubling elements in its story – is being presented in partnership with TimeLine Theatre. The production also is just the latest proof of the immense skill of director Lili-Anne Brown (whose terrific recent shows have included “Buddy: The Buddy Holly Story” and “Marie Christine”), and of Andra Velis Simon, Firebrand’s resident music director (who has big upcoming projects with both Porchlight Music Theatre and Writers Theatre). “Change” is the operative word in this show, which is set in the St. Charles, Louisiana, home of a Jewish family, the Gellmans, and most particularly in the basement of their house. That basement, with its hot, damp, “below sea level” laundry room, is where their African-American maid, Caroline Thibodeaux (the riveting Rashada Dawan), the mother of three daughters, whose abusive husband fled some years earlier, spends many miserable hours each day doing the washing and ironing. Her job, which also includes housekeeping and cooking, comes with a salary of $40 a week – barely enough to live on. The year is 1963. President John F. Kennedy (who has yet to make any significant changes in terms of civil rights) is about to be assassinated in Dallas. The Gellmans are an uneasy family, at best. Eight-year-old Noah (the very natural Alejandro Medina), whose mother recently died of cancer, adores Caroline and clearly resents the arrival of Rose (Blair Robertson), his new stepmother. A friend of his mother’s from New York, Rose moved south (where she is clearly a fish out of water), and quickly married Noah’s father, Stuart (Jonathan Schwart), a clarinetist who is obviously lost and depressed, and unable to communicate with either his new wife or his son. Exacerbating Rose’s sense of alienation is the fact that Noah treats Caroline like a surrogate mother, and this creates a terrible tension and resentment in her. 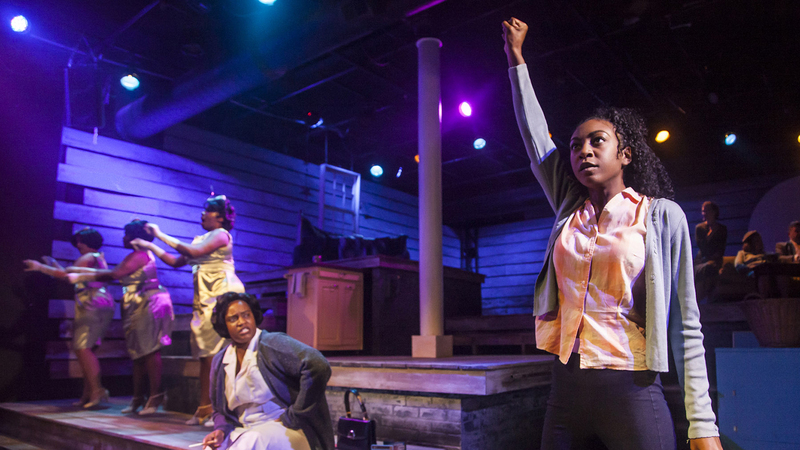 But it is Caroline’s story that is of the essence here, and Dawan, in her white maid’s uniform and thick-soled shoes, rips into the role with such perfectly controlled emotional fire and intense vocal heat that she leaves scorch marks on the stage. Caroline is a woman of immense pride and strength, but she cannot escape her situation the way her more free-spirited and adventurous friend, Dotty (a terrific turn by Nicole Michelle Haskins), has begun to do by going to night school and making plans in a changing society. She also is unable to deal with her rebellious teenage daughter, Emmie (the utterly beguiling young Bre Jacobs), who wants something very different out of life, senses all too well the injustice around her, and has little patience for her mother’s fears. (Emmie even participates in the razing and decapitation of a Confederate statue, a particularly prescient moment given recent events). And then there is the matter of money. The unhappy Rose chafes at Noah’s habit of leaving pocket change in the clothes that Caroline washes, and she attempts to cure him of the habit (and teach him “the meaning of money”) by telling him that whatever coins he leaves in his pockets will be kept by Caroline. This is deeply humiliating and uncomfortable for Caroline, and she refuses to take the money she finds. But then, when Christmas rolls around, and Caroline finds the $20 bill Noah received from his grandfather, she decides it will give her an opportunity to treat her kids. Along the way, not only is the bond between her and Noah severed, but a far greater change takes hold. Tesori’s score is a radiant, often blistering blend of soulful anthems, bluesy self-discovery songs, playful imaginary riffs, impassioned conversations between women waiting for a bus, between mother and daughter, between a woman and her God, and more. Dewan rips the stuffing out of every number as she charts her long, painful path to change and remorse. Tyler Symone, who plays both the sassy inner voice of the washing machine and the dreamy voice of the Moon, is superb. Lyric K. Sims, a tiny girl with big talent, is pure magic as Caroline’s youngest child, with Princess Isis Z. Lang as her lively sister. And throughout, De’Jah Jervai, Emma Sipora Tyler and Roberta Burke are all irresistible early Motown fun as the trio of Radio girls who serve as Caroline’s backup group. But here is the seriously cringeworthy aspect of “Caroline, or Change” that has, from the very moment I first saw the show on Broadway, made me angry. For in his depiction of the Gellmans, of Rose (sharply etched in a notably fearless turn by Blair Robertson), and of Rose’s wannabe socialist/revolutionary father who visits from New York (played by Michael Kingston), Kushner promulgates and reinforces the most pernicious stereotypes about Jews and money, never noting the fact that Jews were not only outsiders themselves in the Deep South at the time, but, from early in, were deeply engaged in the civil rights struggle. And while no group is beyond criticism, this portrayal feels especially poisonous now, when anti-Semitism is again rearing its ugly head in many places. That said, Firebrand’s production – and its wonderful musicians, including Emily Beisel (reeds), Kim Lawson (violin), Myles Bacon (guitars), Yulia Block (drums/percussion), and Simon (keyboard) – is mightily impressive on so many counts that it should not be missed. The Firebrand Theatre production of “Caroline, or Change,” produced in partnership with TimeLine Theatre, is now extended through Nov. 11 at The Den 1331 N. Milwaukee Ave. For tickets ($45) visit www.firebrandtheatre.org. Running time: 2 hours and 35 minutes with one intermission. Note: Next up at Firebrand (in May 2019), will be “Queen of the Mist,” John Michael LaChiusa’s musical about Anne Edson Taylor, a schoolteacher who, in 1901, became the first person to survive a trip over Niagara Falls – and who did so in a barrel of her own design.